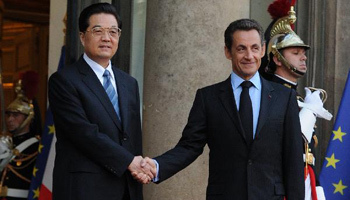 President Hu Jintao and his French counterpart Nicolas Sarkozy on Thursday vowed to boost the comprehensive strategic partnership between their countries. President Hu Jintao met French leaders on Friday, calling for expansion of bilateral cooperation and richer content in the comprehensive strategic partnership and strengthened international policy coordination to support global economic recovery. 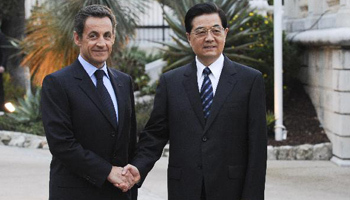 China and France issued a joint statement on Thursday during the ongoing visit of Chinese President Hu Jintao to France, pledging to strengthen comprehensive strategic partnership between the two countries. Chinese President Hu Jintao on Friday urged major economies to jointly shore up the burgeoning economic recovery worldwide in the wake of the latest global financial crisis. Chinese President Hu Jintao met with Portuguese Prime Minister Jose Socrates here on Sunday, exchanging views on the development of the comprehensive strategic partnership between the two countries. Both China and Portugal boast ancient civilizations and have made great contributions to human progress, Hu said during a meeting with Silva, noting that the smooth settlement of the Macao issue has set an example for other nations to tackle outstanding historical disputes. Chinese President Hu Jintao arrived in Lisbon Saturday for a state visit aimed at further strengthening the China-Portugal comprehensive strategic partnership.